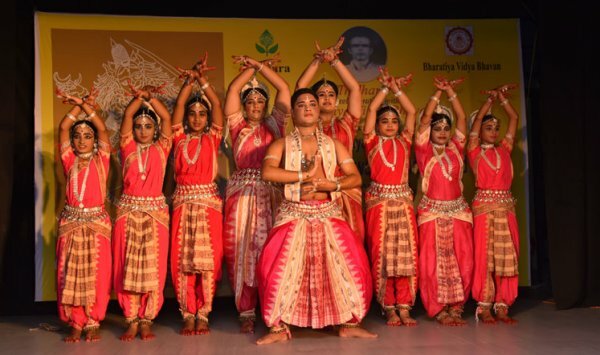 Tridhara in collaboration with Bharatiya Vidya Bhavan, Bhubaneswar, organized the 'Nritya Guru Pandit Bhubaneswar Mishra Award Festival 2018' on 28th April, at the Munshi Hall, Bharatiya Vidya Bhavan, Bhubaneswar. The program was dedicated to one of the most versatile Odissi nritya, sangeet and mardala maestro, Guru Bhubaneswar Mishra. It was under the initiative and leadership of Guru Gajendra Panda, Director, Tridhara, that this award ceremony, which was held earlier in a small scale in Pandit Mishra's village, was organized for the first time in Bhubaneswar. 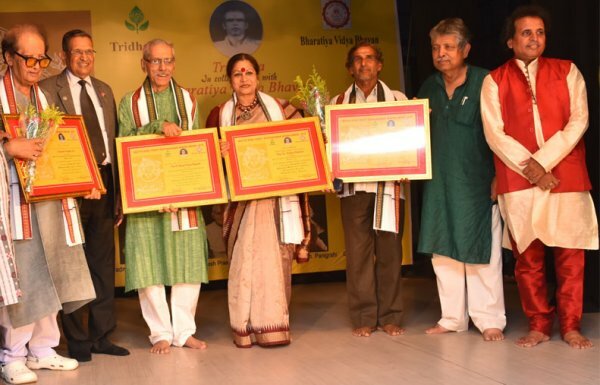 The prestigious "Nritya Guru Pandit Bhubaneswar Mishra Award" for lifetime contribution in their respective fields went to Prafulla Kar (music), Dr. Ramesh Prasad Panigrahi (play writing and direction), Guru Ramesh Chandra Panigrahi (folk dance) and Dr. Puspita Mukherjee (Odissi dance). 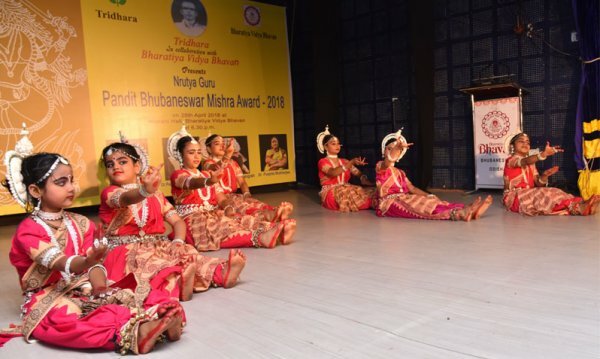 To pay homage to the acclaimed guru for his unparalleled contribution in the field of Odissi culture, the young dancers of Tridhara presented popular items including a solo by Guru Bhubaneswar Mishra's grand-daughter after the formal award ceremony. Guru Pandit Bhubaneswar Mishra was born in 1935 in a culturally rich musically oriented family at Birakesharipur Sasan of Golabai, Puri district. His father Sadashiv Mishra was a popular mardala player. His grandmother Motimani "Bramha" Mohapatra was one of the most renowned poets of Odisha and an Odissi singer. The title "Bramha" was conferred on her by the Puri Gajapati Maharaj. Guru Mishra began his first training of Odissi Chhanda, Choupadi, Champu and Choutisa from his grandmother at the young age of 9. This created an interest in him for Odissi dance and music and after preliminary training from his father, he went to train in Odissi dance under the legendary Guru Batakrushna Sena at Annapurna Theatres, Cuttack, Odissi mardala under Guru Dayanidhi Tripathy and Odissi music under Guru Sukadeva Patriat at the age of 11. After completing his Matriculation, he joined as a clerk at the Health Department of Odisha but left the job after some months, as it was affecting his passion for dance and sangeet (vocal). He was also trained in Odissi music from the acclaimed Simhari Shyamasundera Kar. He began teaching Odissi dance and mardala at Kala Bhawan, one of the oldest institutions of Cuttack founded by his mardala Guru Dayanidhi Tripathy. He also taught Odissi dance at Rajdhani Kala Sansad, Bhubaneswar, and evolved as a renowned multi-talented Guru of Odissi "Nritya, Geeta, Badya" of his time, creating some very talented gurus and artists who are of national and international repute at present. While travelling through Odisha to spread the culture, Pandit Mishra actively taught dance and directed Odissi dance dramas, plays and jatras. Odissi sangeet Guru Paschimeshwar Jena, Odissi percussionist Guru Jaykrishna Kahali, Odissi sangeet Guru Prabhakar Srichandan, Odissi dance artist Usharani Pratihari, Guru Durga Charan Ranbir, Guru Sarat Sahoo and Guru Gajendra Panda are some of the illustrious gurus and artists who took their preliminary training and support from Guru Mishra. He served the underprivileged and the needy often imparting free dance training. But the great guru passed away in 1987 at the age of 52, leaving a void in the field of Odissi culture. The festival began with an invocatory group performance "Gananayak Panchakam", dedicated to Lord Ganesh, scripted by Pt Nityananda Mishra, set to music by Prafulla Kar with ukuta by Guru Dhaneswar Swain and Sabdaswarapata and choreography by Guru Gajendra Panda. It was the popular story about the creation of Ganesha by Parvati using the turmeric paste from her body at bath and breathing life into it and declaring him to be her own loyal son. Since Parvati wished to bathe, she posted Ganesha on guard at the door. When Shiva came home, he was enraged to find this strange boy not letting him enter his own house! Shiva's fury, astonishment at seeing the divine power of the boy, severing his head, breathing life into Ganesha again after realizing his mistake and final acceptance as his son were convincingly portrayed by the well-trained dancers displaying good teamwork and coordination. The typical footwork of Chhau nritya, Prahallad Natak and Raas were vividly portrayed in the choreography of Gajendra Panda. The reddish peach costumes need mention. The pure dance item Kiravani Pallavi in Talamalika set to Pandit Laxmikant Palit's music and Guru Dhaneswar Swain's ukuta, choreographed by Guru Gajendra Panda proved the technical training of the dancers. This Pallavi began with "Ghanta Mardala" pattern of ukuta which culminated from the worship of Lord Jagannath. In this piece, there was also the use of "Padi", the fast singing patterns of Odissi with immediate changes in talas and Chhandas offering rhythmic delight. It was apt that Guru Bhubaneswar Mishra's grand-daughter Suhana Mishra took to stage with a solo presentation of the much loved Odia abhinaya, "Kede chanda jane lo sahi", written by Vaishnav poet Banamali Das. She proved her competence as a dancer and impressed with her abhinaya in the use of sanchari bhava while portraying Putana Vadha and Viswaroop Darshan of little Krishna. "Dasavatar" was one of the versatile and powerful compositions of Guru Debaprasad Das incorporating interesting folk rhythms of Odisha interpreted in the ukuta using dhol, khola, guduki and dhemsa. It was a research oriented composition, quite different from the common fare and used ukutas or rhythms like "digi digi dehenta", "khiri khiri tamkhitram", "dharigidha narigidha", "dhigi dhigi", "drugudu taka" to complement different avatars. The next item "Durga Tandav" is a favourite piece of Tridhara. Based on raga Patadeep and tala ekatali and triputa, this dance is dedicated to Goddesses Durga, who loves singing and dancing with the sounds of ghanta and mardala, fought with demons and killed the demon king Mahishasura, Chanda Munda and many more. It is always a delight to watch the dancers perform with Adiguru Sankaracharya's "Gopini basini, dusta binasini gharghar badini hasyarate.... Jaya jaya Durga titarini bhabini manini palini daninihey" choreographed by Gajendra Panda. The evening concluded with 'Gachera Mamata' (love of the tree), a meaningful presentation by children, with a message to protect our environment. The piece opened at daybreak when a woodcutter goes to a forest and starts cutting a tree.The tree explains the necessity of trees being on Earth and requests the woodcutter not to cut it but when he ignores it, all the birds living on the tree attacked him. The squirrel bit the feet of the woodcutter and he fled from the forest. The same evening the woodcutter described this story to his villagers.The headman realizing the importance of preserving the trees decided that trees should not be chopped off. Instead, they should be worshipped as the existence of man depends very much on the trees. The piece was received very well by the audience. Srinibas Ghatuary compered the festival with his usual élan. Dr. Nita Vidyarthi is a veteran critic of performing arts and writes on dance, music and theatre in leading publications.